Our San Francisco furnished apartments are located in iconic neighborhoods, from North Beach to Pacific Heights to Russian Hill and more. Step out of your door and hop on the trolley. Look out your window and enjoy gorgeous views of Alcatraz, the Golden Gate Bridge, and many more San Francisco landmarks, every day. 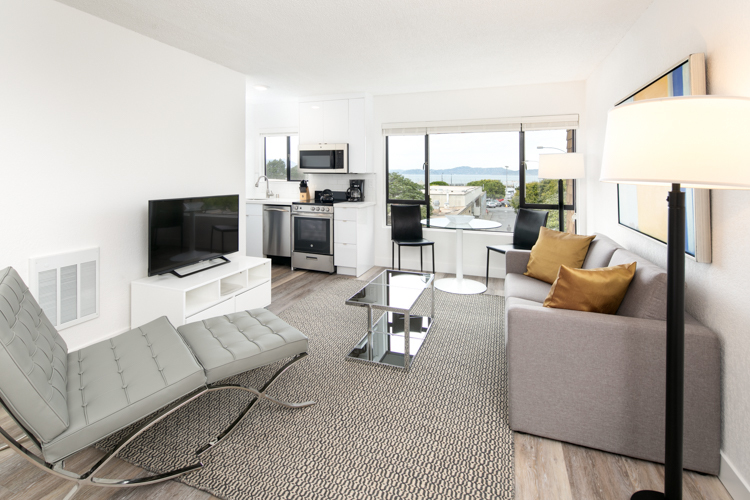 Our apartments for rent in San Francisco feature quality finishes, higher ceilings, angled walls, skylights and fireplaces, and soundproofing. Its details like these that help make our San Francisco furnished apartments feel like home. Timeless and tasteful, our classic architectural design aesthetic sets the tone for our brand. Refined, uncluttered and immune to fleeting trends, we sum up our style in two words: understated elegance.